The Corporation is a 2003 Canadian documentary film written by Joel Bakan, and directed by Mark Achbar and Jennifer Abbott. The documentary is critical of the modern-day corporation, considering its legal status as a class of person and evaluating its behaviour towards society and the world at large as a psychiatrist might evaluate an ordinary person. This is explored through specific examples. Bakan wrote the book, The Corporation: The Pathological Pursuit of Profit and Power, during the filming of the documentary. Provoking, witty, stylish and sweepingly informative, THE CORPORATION explores the nature and spectacular rise of the dominant institution of our time. 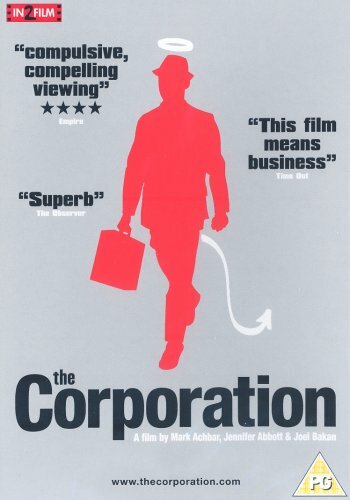 Part film and part movement, The Corporation is transforming audiences and dazzling critics with its insightful and compelling analysis. Taking its status as a legal "person" to the logical conclusion, the film puts the corporation on the psychiatrist's couch to ask "What kind of person is it?" The Corporation includes interviews with 40 corporate insiders and critics - including Noam Chomsky, Naomi Klein, Milton Friedman, Howard Zinn, Vandana Shiva and Michael Moore - plus true confessions, case studies and strategies for change. Here are a couple of interviews with Joel Bakan just so you know where he's coming from. The documentary even got a decent review from The Economist...!